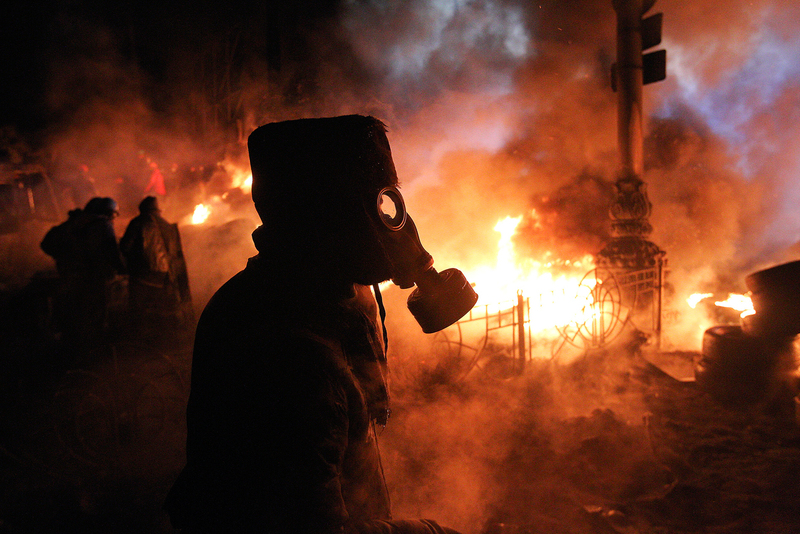 Anti-government protesters gather at a barricade at the site of clashes with riot police in Kiev. Russian television has broadcast Oliver Stone's controversial documentary film “Ukraine on Fire,” in which he argues that Ukraine's “Maidan” uprisings of 2004 and 2014 were the result of political maneuvering by the United States. A controversial new documentary produced by U.S. director Oliver Stone and broadcast on Russian television presents the Ukrainian revolutions of 2004 and 2014 as organized uprisings instigated from outside and planned with U.S. participation. Posted on YouTube and screened by nationwide Russian TV channel REN TV on Nov. 21, the film, titled Ukraine on Fire, features Ukraine’s ousted former president Viktor Yanukovych, Russian President Vladimir Putin, and Vitaly Zakharchenko, who served as Ukrainian interior minister under Yanukovych, discussing the events leading up to and following the “Maidan” revolution of 2014. Stone, an award-winning director who is a staunch critic of Washington’s foreign policy, is no stranger to controversy and has a long history of making political films. He also directed 2015’s Snowden, a biopic of the fugitive former NSA agent turned whistleblower. Directed by Ukrainian American Igor Lopatenyuk, the film has been criticized for its one-sided portrayal of events in Kiev, with a Ukrainian citizen named Andrei Nezvany posting an online petition two days before the film's online premiere asking for the picture to be banned because it "falsifies facts" and could "provoke mass protests in Ukraine." Ukraine on Fire was made by the Los Angeles company Another Way Productions though the source of the project’s financing is not clear. The film reports that the CIA closely collaborated with Ukrainian nationalistic organizations against the USSR as far back as 1946, using them as counterintelligence sources. Recently declassified CIA documents apparently bear witness to this. Oliver Stone on why Russia is a natural ally of the U.S. According to the film, "by the end of 1941 alone the nationalists killed between 150,000 and 200,000 Jews on German-occupied territory in Ukraine," and the following "strong alliance" allowed them to escape after WWII to Europe, where the CIA helped them hide. For example, the film points out that Mykola Lebed, a Ukrainian nationalist and activist who was responsible for mass killings of Poles in Ukraine’s Volyn region under Nazi occupation in WWII, was later transferred to the U.S., where he died in 1998 without ever facing trial for his war crimes. But American collaboration with the Ukrainian nationalists did not end there, claims the film. In 2004 Ukraine became a battlefield between Russia and the West. The pro-Russian candidate Viktor Yanukovych won the presidential election, though the process was tainted by widespread allegations of intimidation and massive vote-rigging, as well as the poisoning of the pro-Western candidate, Viktor Yushchenko. In the end, Yushchenko, whose wife had been an employee of the U.S. State Department during the Reagan administration) gained the presidency thanks to a peaceful protest that the film claims was inspired from outside the country, resulting in a revote. Subsequently, the off-screen voice narrates, the Yushchenko government failed to carry out the promised reforms and the "democracy" project, and mired itself in dishonest activities. Viktor Yanukovych became the next Ukrainian president, but his talks with the EU did not go well. "We had been counting on the International Monetary Fund [IMF]… But for a whole year we were offered unacceptable options… Russia was the last resort. Russia told us: 'We are ready to work with you as partners, if you take our interests into consideration,'" says Yanukovych in the film. Commenting on Russia’s introduction of restrictions to trade with Ukraine, Vladimir Putin says that the Kremlin did so only because in the event of integration with the EU "the European Union would basically be entering our territory with all its goods without any negotiations." "We said, sure, if Ukraine has decided to do this, this is its choice and we will respect it, but we are not going to pay for this choice," says Putin in the film. In the film, Zakharchenko tells Stone that the Ukrainian authorities knew that protests were being prepared for 2015. But the sudden halt to integration with the EU (after Russia made Ukraine a counter-offer shortly before Yanukovych was due to sign the agreement at an EU Eastern Partnership summit in Lithuania in late November 2013) accelerated the process. Public organizations financed by NED, journalists receiving U.S. grants and the TV channels created on the eve of the Maidan uprising played an important role, argues the film. The order to drive away the protesters with force was given by head of the presidential administration Serhiy Lyovochkin, under the pretext of putting a Christmas tree on the square. "It is an amazing coincidence but Mr. Lyovochkin is a friend of many American politicians," the documentary reports, showing a photo of Assistant Secretary of State for European and Eurasian Affairs Victoria Nuland. When Stone asks Yanukovych if "he felt America's hand" in the uprising, the former president says that many delegations came to Ukraine but took sides with the protesters, something that only exacerbated the conflict. "When protesters seize government buildings, is this acceptable? Would it be acceptable if the Ukrainian ambassador had come to the protestors in Ferguson and handed out cookies or accused American policemen? Why was Ukraine treated in this manner?"